Such opportunities for innovation are evident in the most recent collection released through the Honest by platform. Rombaut for Honest by, is an exclusive (albeit very small) unisex collection of shoes made from tree bark. The 26 year old Paris-based designer, Mats Rombaut, who set out to create a 100% plant-based shoe for the collaboration, combined biodegradable fig tree bark from Uganda with other plant sourced components – natural rubber sole, cotton lining and potato starched cotton shoe laces. Once the bark cloth is created, it is hand-dyed and made into Rombaut’s ‘Amazon Derby’ shoes in Tuscany. To finish, the shoes are coated in natural rubber (itself derived from the bark of the rubber tree) which make them water repellent and more durable. The shoes even come with a Latex Care Kit which includes a natural rubber mix to retouch them. The natural rubber – in both the coating and the sole - is more environmentally friendly than synthetic rubbers that are most commonly used in footwear as it will decompose in landfill, whereas the synthetic version will not. Like all the pieces featured on the Honest by platform you can find out about the origin, provenance and cost of every component in the shoe, from the main material, down to the thread they were stitched with, and the shoe box they are delivered in. At €759 (approximately £642) they are perhaps a little more than many of us can spend on shoes, but it’s always fun to dream! Bark is not a material we associate with high-end fashion, or fashion at all for that matter. 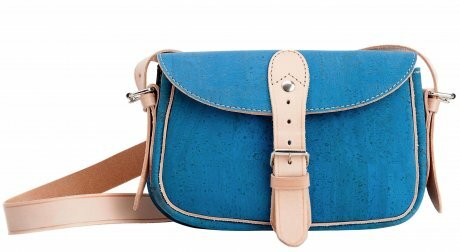 One unlikely evergreen that has made its way into high end accessories is the cork oak, and Portuguese company Pelcor have truly pushed the boundaries with the use of its 'tree-hugging' material in their upmarket bags. Sandra Correia, the designer behind the brand, comes from a long line of Portuguese cork producers. She set out to transform the reputation of cork - primarily known for its functional use in wine bottles - into a highly desirable material, whilst also providing a way to support and sustain the cork industry. Pelcor take advantage of the natural qualities of the material. Aside from its physical beauty cork is very soft to the touch, lightweight and flexible, but also durable and water repellent. Each product made from cork is unique - no two cork oak trees are the same - and, what makes it a more sustainable option is that the tree regenerates itself after harvesting. Pelcor offers simple and classic designs, which ensures their pieces are timeless and withstand the coming and going of trends. 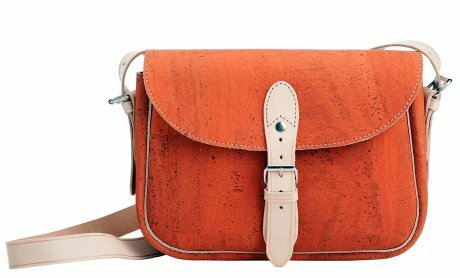 Their recent release, the ‘Stroll Satchel’ combines cork with leather trimmings to modernise the traditional bag used by the Portuguese postman.